Ellen White (1827-1915): “God made him [Lucifer] good and beautiful, as near as possible like himself” (RH, Sep 24, 1901). Christopher Reyes: Cites Thomas Aquinas (1225-1274 AD): “The Angel,” writes Saint Thomas, “Is the most excellent of all creatures because among all creatures he bears the greatest resemblance to his creator. The glossa on Ezeckiel, 28, ‘Thou wast the seal of resemblance, says: The more subtle their nature [the Angelic nature], the better the image of God found expressed in them’” (In His Name, p. 192, 2010). Ellen White (1827-1915): “The great Creator assembled the heavenly host, that he might in the presence of all the angels confer special honour upon His Son….The Father then made known that it was ordained by Himself that Christ, His Son, should be equal with Himself,…His Son He had invested with authority to command the heavenly host. 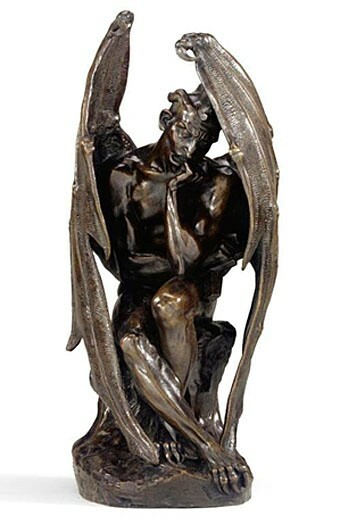 Especially was His Son to work in union with Himself in the anticipated creation of the earth,…Lucifer was envious and jealous of Jesus Christ….He thought….why should Christ thus be honoured before himself?…. [So] They rebelled against the Son” (SR, pp. 13-15, 1947). Daniel Defoe (1660-1731): “Hence that notion (and not ill-founded); namely, that the first cause of his disgrace, and or which ensued his rebellion, was occasioned upon God’s proclaiming his son generalissimo, and with himself supreme ruler in heaven; giving the dominion of all his works of creation, as well as already finished, as not then begun, to him; which post of honour (say they) Satan expected to be conferred on himself, as next in honour, majesty, and power, to God the supreme” (The History of the Devil, p. 25, 1854 [first published in1726]). Ellen White (1827-1915): “As I beheld him, his chin was resting upon his left hand. He appeared to be in a deep thought” (Story Redemption, p. 46, 1947; Early Writings, p. 153, 1882). The following illustrations exactly portray what Ellen White had seen in her vision. Here we have an example of her indebtedness even to paintings sculptures. Illustration No. 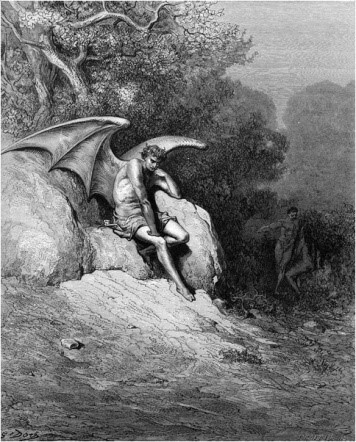 14. is from John Milton’s Paradise Lost, – a book from which she drew material for her Great Controversy themes. Ellen White (1827-1915): “God is the Father of Christ; Christ is the Son of God. To Christ has been given an exalted position. He has been made equal with the Father. All the counsels of God are opened to His Son” (8T, p. 268, 1904). John Milton (1608-1674): “Of angels by imperial summons called. Innumerable before the Almighty’s throne … Hear, all ye angels … Hear my decree, which unrevoked shall stand. This day I have begot whom I declare My only Son, and on this holy hill Him have anointed, whom ye now behold at my right hand. Your head I Him appoint; and by Myself I have sworn” (Paradise Lost, Book V, 553-586, 587-620, 1667). Ellen White (1827-1915): “Angels that were loyal and true sought to reconcile this mighty, rebellious angel to the will of his Creator. They justified the act of God in conferring honor upon Jesus Christ, and with forcible reasoning sought to convince Satan that no less honor was his now than before the Father had proclaimed the honor which he had conferred upon his Son. They clearly set forth that Jesus was the Son of God, existing with him before the angels were created; and that he had ever stood at the right hand of God,…They anxiously sought to move Satan to renounce his wicked design and yield submission to their Creator; …Satan refused to listen” (1SP, pp. 19, 20, 1870). John Milton (1608-1674): “I, in one night, freed from servitude inglorious well-nigh half the angelic name, and thinner left the throng of His adorer” (Paradise Lost IX, 108-141; 142-175, 1667). Ellen White said that God allowed Lucifer to prove his strength with Jesus: “He would give the rebellious an equal chance to measure strength and might with His son and His loyal angels” (1Sp, p. 21, 1870; SR, p. 17, 19, 1667). John Milton (1608-1674): “That they may have their wish, to try with me [Jesus], in battle which the stronger proves; they all, or I alone against them; since by strength they measure all, of other excellence” (Ibid, VI, 794-827, 1667). Ellen White (1827-1915): “Having conquered Adam, the monarch of the world…he would establish his throne and be monarch of the world” (RH, 1874). John Milton (1608-1674): “Here thou shalt Monarch reign…Retiring, by His own doom alienated, and henceforth Monarchy with thee divide” (Paradise Lost, X. 375-408, 1667). Daniel Defoe (1660-1731): “…he was truly and literally the universal monarch, nay, the god of this world” (The History of the Devil, p. 101, 1854 [first published in1726]).